The fovea is the small, dimple like point at the center of the retina. It is the point of sharpest vision and color. 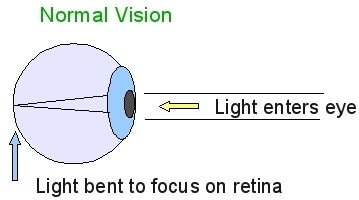 In a normal, healthy eye the fovea is the point at which the light, bent by the lens, intersects. In other words it is focused on that point. When we change our distance of focus we change the shape of the lens. (Called Accommodation). 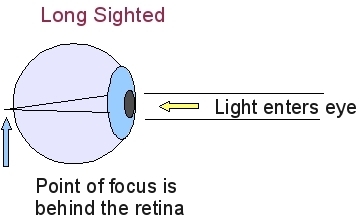 Distant objects require a more flat lens to keep the point of intersecting light rays on the fovea. Close objects require a more convex or rounded lens to keep the light focused on the fovea. As we focus on nearer objects, part of the accommodation reflex is a constriction or narrowing of the pupil diameter so that less light can enter the eye. This cuts down light from the periphery, or outside of the visual area from coming into the eye. If light from the peripheral field were allowed to enter, the result would be blurry vision. This point is of great interest with respect to pinhole glasses, and why they have a place in vision programs (they cut down scattered and peripheral light). However, it is because they work by cutting down peripheral and scattered light that they should not be considered as a cure or treatment, but simply to support more advanced eye exercises. It is also critical to note that pinhole glasses can actually contribute to suppression of vision in the weaker eye, a quite serious side effect and something to be avoided. Early research into how this constriction and dilation of the eye may be regulated is fascinating. The health of this “reflex” may in fact play a small role in blurry vision. An inadequate response would allow too much light, resulting in something similar to over exposure in a camera! If light coming into the eye is not focused on the fovea, we will have poor or blurry vision. If it is focused in front of the retina the result will be shortsightedness. If focused behind the retina, long sightedness. If you have done experiments with a magnifying glass and sunlight, you will know that distance from the object you are trying to concentrate light on is critical. If you hold the glass/lens just a little too distant, or a little too close, you get a larger, but less intense spot of sunlight. For the smallest, but most intense spot of light, you must have the intersection of the light rays crossing right at the target. This is just like our eyes. The lens must focus so the intersection point is at the fovea/retina, not in front of it, and not behind it! 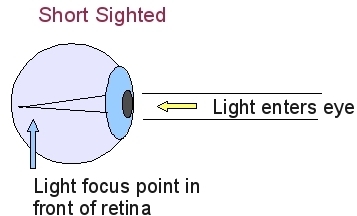 Compare this to the next example: a shortsighted (myopic) eye where the light is focused in front of the retina. 1. You can get corrective lenses or glasses to move the focal point back to the retina, (concave lenses), or forward, to the retina, (convex lenses.) Of course this solution will do nothing to slow the process which has led to the problem. It may in fact speed up the deterioration. 2. Depending how far out or significant the refractive error is, you can re-train your eye to focus differently. Until recently it was believed that the adult brain and vision processing pathways could not be retrained. This is not the case. There is now compelling evidence that it is almost as trainable as a child’s. This is exciting because it means that with the correct eye exercises, or “training” environment and activities, you can actually retrain your eye (really your brain) to focus the light in the correct place. With long sightedness, short sightedness, presbyopia, amblyopia etc, the eye/s must be retrained. To do this requires good eye exercises and therapy which address the whole visual system. The basic eye exercises most of us find, or know about, will not do it. The program must deal fully with suppression. Suppression is where visual data from one eye is suppressed by the brain and effectively not “seen”. A good eye exercise program will also provide binocular synchronization and have both eyes fully involved and acted upon. It must also deal with the individual strength or state of each eye, and enable a re-learning of focal distances, or accommodation, in relation to convergence distances. Convergence is the point at which the line of sight of each eye “crosses” over, or “converges”. This does not mean the exercises are “hard”, it just means they must be effective for your needs. 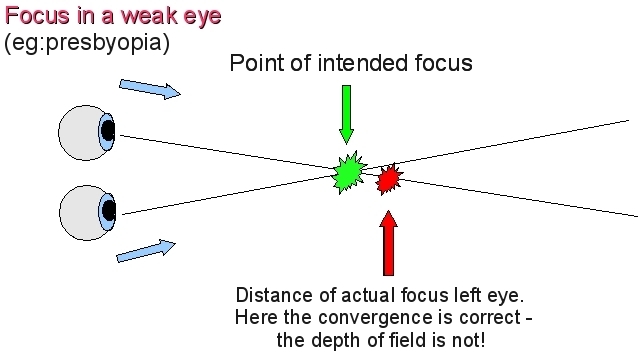 This illustration shows how the point of focus and the crossover point in normal vision are all synchronized. Now compare this with an illustration where crossover and focus are out of sync, as for example in presbyopia, or long sightedness. If this person were to hold a book at the green (crossover) point, it would be out of focus and blurry. As a result, they will unconsciously move the book farther away until it is in focus. Probably somewhere around the red point. That focus may be one or both eyes. If the weaker eye remains out of focus the brain will simply suppress it and leave the job to the stronger eye. Of course, as either, or both eyes weaken that point where both both or one eye is in focus just gets more distant. The red, illustrating the actual point of focus, is now inside the convergence point. 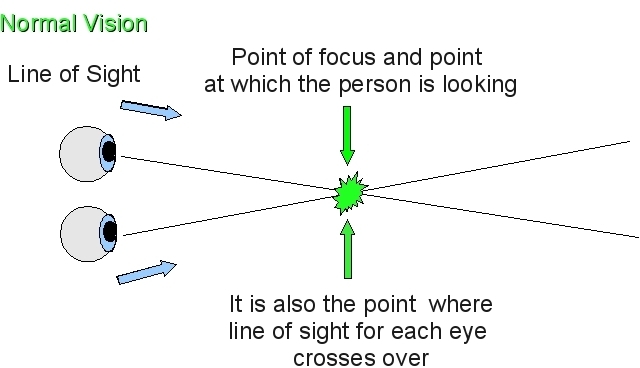 (this may be the case for one or both eyes) As the person looks further away the focus has failed to accommodate. As noted: with myopia the lens fails to flatten out sufficiently to focus correctly at greater distances.These eyes need exercise and vision therapy to improve flexibility and tone in the suspensory ligaments, and the lens. This therapy also needs to re-address the brain patterns and habits of focal distance and synchronization. The Eye Gym contains a process which enables the user to separate the action of lens control from convergence control. An important part of retraining focus and convergence patterns. As an illustration of the significance of this, see if you can change the focal distance of your eyes without changing the convergence. This is called “decoupling” and is at first hard to do. The closest most of us get is the “magic eye”, or stereo gram 3D pictures most of us have tried.